My husband, twin sister and I purchased our 31′ 1974 Airstream Sovereign on August 9th, 2011. This blog will document our DIY renovation and future adventures. We live in Scottsdale, Arizona and can’t wait to start travelin’ in style. Satellite TV of course. What are your thoughts for internet? Matt intends to lose contact with the world, once we are on the road with the airstream. ha. on August 19, 2011 at 1:08 pm | Reply Kirstin E.
This is soooo rad! Dont be alarmed if you find me and Ladmo hanging out in there! LOL! I want to do this SO bad! I just went and looked at a 1975 Airstream Sorvereign – 31 foot yesterday. I’ve bookmarked your site and will be checking your progress. How fun!!! So, we got the 1975 Airstream Sorvereign – 31 foot. He WE go!!!! Wish us luck. Any pointers? Congrats on the airstream! The old ones can be a handful, but hopefully you have a better condition one than we have. My best advice is to be patient with a remodel…I pushed for a full remodel in a month and caused my husband to burn out on the project. Hopefully, we’ll make progress again real soon! What state are you in? I love your site! 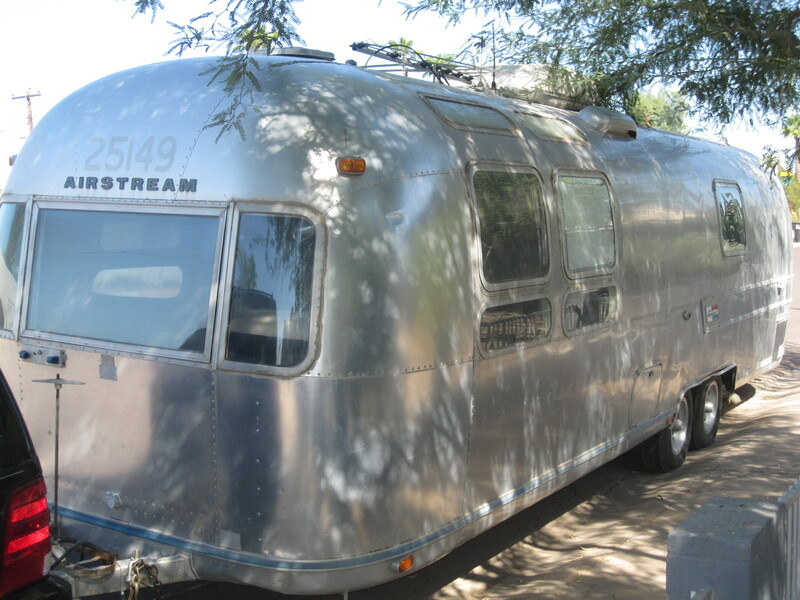 Our friend, Michelle Hotchkiss, met you at Modern Phoenix yesterday, and told us about your Airstream. We have a 1957 El Rey trailer, which is a riveted trailer very similar in design to a 1950’s Airstream. It required a full restoration, and has now become part of our family. Best of luck with yours- it’s looking great! Hi Airstreamy, just discovered your blog. Thank you for all the inspirational pictures you posted. I am about half way thru a major shell off restoration so I can use all the ideas I can get!! Looking forward to more from you guys keep it up. Am headed to Europe for the holidays and will be storing my Motorhome in vegas. Should be back around the 15th of January. Hard to find young adventurers out there! Just wanted to say thanks for all the information. We just put a deposit on a 1979 31′ Sovereign in need of some TLC. Your blog has helped a lot. Andreas, sorry for the delay in responding! Did you guys pick up your 1979 yet? Do you blog? Happy travels! Thanks so much for including me on your blog roll! Love your blog and it seems like you’re having fun with your 31′ Sovereign. Congrats! I just found your blog. Way cool! I have a ’74 Sovereign that was nearly gutted and I’m slowly filling it up with cool stuff. I had a great time watching your progress and it’s nice to see an Airstream similar to mine get the personal touch. I really like your painted interior and I think I might do the same.